Dhoni unleashed his funnier side as the trio posed for photographs at Ranveer Singh and Deepika Padukone's reception in Mumbai. 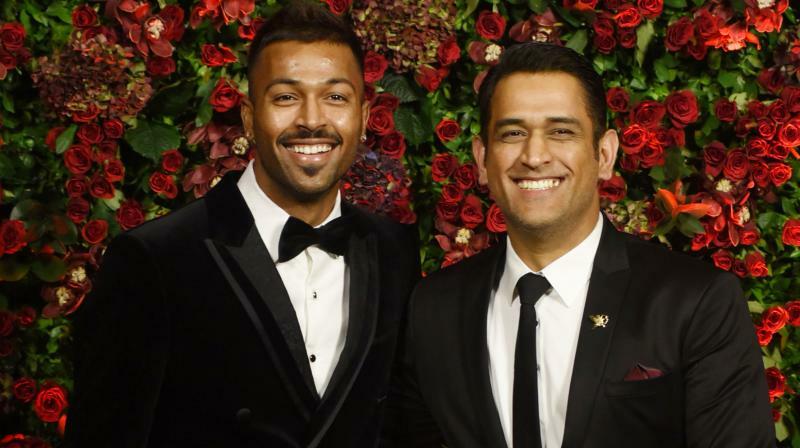 Mumbai: Team India cricketers MS Dhoni and Hardik Pandya were among the many celebrities to be present at Ranveer Singh and Deepika Padukone's wedding reception in Mumbai on Saturday. The Bollywood couple hosted their third reception in Mumbai for their close friends from the industry and along with Hardik, Dhoni posed for photographs with his wife Sakshi before she suddenly moved out from the frame. The veteran wicketkeeper-batsman then unveiled his funnier side requesting Hardik Pandya to take his arm as they were surrounded by the paparazzi. The duo, who are not a part of India’s ongoing tour of Australia, were last spotted together celebrating Sakshi’s 30 birthday along with a host of other cricketers in November. Mike Hussey, who has a fair idea about the current crop of India players, feels that all-rounder Hardik Pandya’s absence will “hurt” the visitors in the upcoming Test series against Australia. The series starts on December 6 in Adelaide. Pandya is undergoing rehabilitation after suffering a lower-back injury during the Asia Cup in Dubai last September. “I think Hardik is a wonderful talent and I am sure his game style would have been suited to the Australian conditions. Add to that, the balance he offers the team with his all-round abilities, yes I think his absence will hurt India,” Hussey said. India have a good chance of doing well against a depleted Australia but ‘Mr Cricket’ is confident that the home team’s seasoned bowling attack will test some of the younger batsmen in the visiting team. India are being dubbed as favourites in many quarters primarily due to the absence of Steve Smith and David Warner. Unlike some of the experts who are still not convinced about Tim Paine’s leadership skills, the current Test captain has Hussey’s vote of approval. “I wouldn’t underestimate Tim Paine, he is an excellent competitor and will be up for the fight against India. Yes, he has the mental strength to lead this Australian side,” he asserted.